Camden Asbury Village offers a sophisticated lifestyle that comes with personalized service, modern-day conveniences, and sought-after amenities. 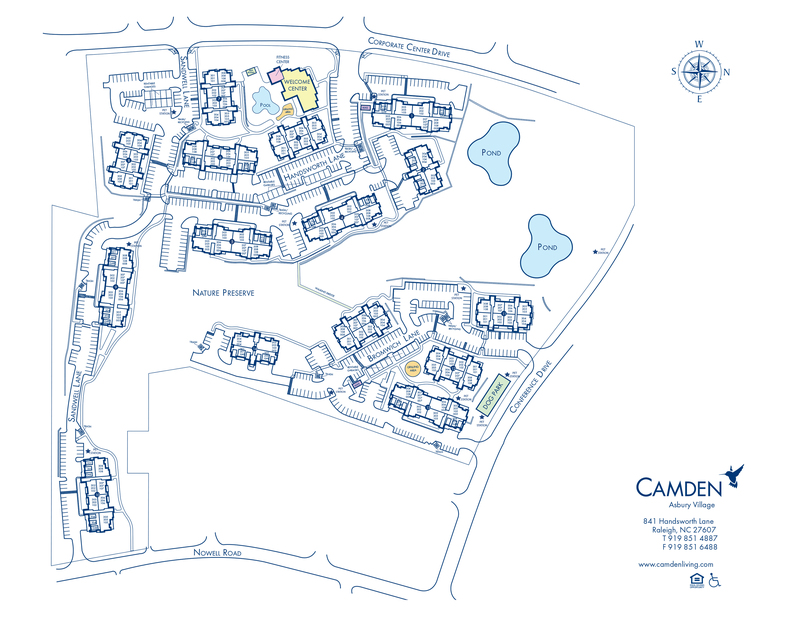 Close to everything, Camden Asbury Village delivers the many conveniences of the RBC Center, Rex Hospital, RDU – Raleigh-Durham International Airport and the Research Triangle, and a serene backdrop of garden-style courtyards and tree-lined streets. Our luxury one, two, and three bedroom apartment homes were designed with upscale living in mind. Chef inspired kitchens include designer stainless steel appliances, quartz countertops, gourmet kitchen islands, custom cabinetry and spacious kitchen pantries and linen closets. Distinctive details continue throughout your new home with custom features you deserve like 9-foot ceilings and decorative crown molding, pendant and LED lighting, built-in computer niches and bookshelves, electric fireplaces, outside storage, private patio or balcony and full-size washer and dryers. Relax alone or with friends at our open air cabana with outdoor fireplace next to a resort-style pool, spa, and convenient grilling stations. You can even drop the costly gym membership by using Camden Asbury Village's newly renovated 24-hour fitness center complete with cardio, weights, Fitness on Demand and more! Celebrate life's greatest moments with room for everyone in our clubhouse with a full kitchen, free Wi-Fi, flat screen TV, and adjacent game room with a billiards table. Get some work done in the cyber café or take your furry friend by the off leash dog park and pet grooming station. Enjoy added conveniences like carports, storage, attached and detached garages - plus we've got electric car charging stations available for residents. The good life is waiting for you at Camden Asbury Village in Raleigh NC. Check out our available apartments here. Restricted breeds: American Pit Bull Terrier, American Staffordshire Terrier, Staffordshire Bull Terrier, any mix of the previous breeds, or any other dog or breed deemed aggressive. See management for pet approval. Get the perfect spot! All open parking is first-come, first-served for Visitors. No permits required! Garages are available for you! Attached Garages are a part of your monthly rent at $125 per month and Detached Garages are an additional $100 per month. Carports are available for $20 per month. Please check with the on-site team to see if they're running specials on available parking options!